If you follow me on social media, you may already know that yesterday I donated 8 inches of my hair as part of Pantene Beautiful Lengths National Donate Your Hair Day to help create real hair wigs for women fighting cancer. When I entered the BANG Salon in Toronto on the Danforth, there was already a buzz of excitement and nervousness in the air. Many ladies had much longer hair than mine and went just as short as I did! I was in the amazing hands of Justin German, owner of BANG Salon and Pantene Consulting Stylist. He suggested we cut my hair using two ponytails instead of one which would keep a little more length. It's a strange experience going for a hair cut when at the beginning you are presented with cut off ponytails of your own hair, but there's also the feeling of thankfulness knowing that you have strands of hair to give that can help someone else feel a small sense of normalcy when they are going through a difficult time. 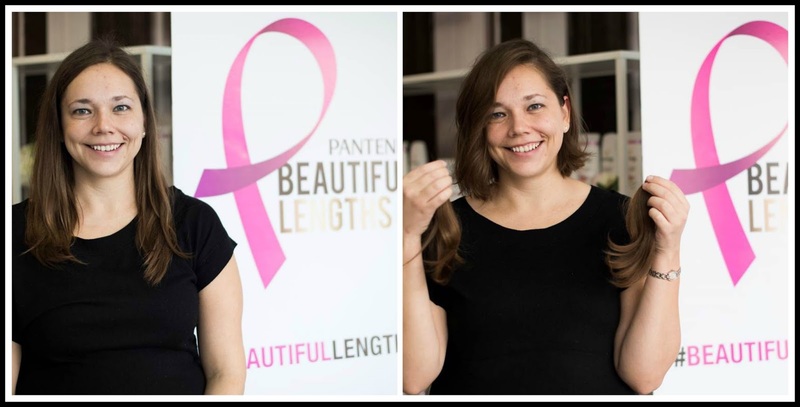 If you are thinking of donating, Justin says that it's best to prep your hair with Pantene Beautiful Lengths Shampoo and Conditioner, as it strengthens hair to prevent breakage and nourishes hair to help it grow. Before he started to give me a cut, Justin asked how much time I have to spend in the morning on my hair and what it looks like in its natural state. I told him my hair ended up in ponytail most days (no longer an option) and he kindly called me low-maintenance. He worked with the small wave I have when my hair air drys - and told me to use Pantene BB Cream to assist the wave versus fight it. He made my hair look great - and gave me a little more time to sleep every morning! In addition to prepping your hair with Pantene Beautiful Lengths Shampoo and Conditioner, Justin recommends anyone going through a big change to ask their stylist for tips, including how to use the proper products for your hair type. After getting the big cut, I had a chance to sit down with Deirdre Brough, Associate Director of Corporate Engagement at the National Office of the Canadian Cancer Society. You can donate your hair all year long - and Deirdre told me many people (boys, girls, men and women) do. Some people host donating parties, and others fundraise money by having people donate to the cause by supporting the cut. 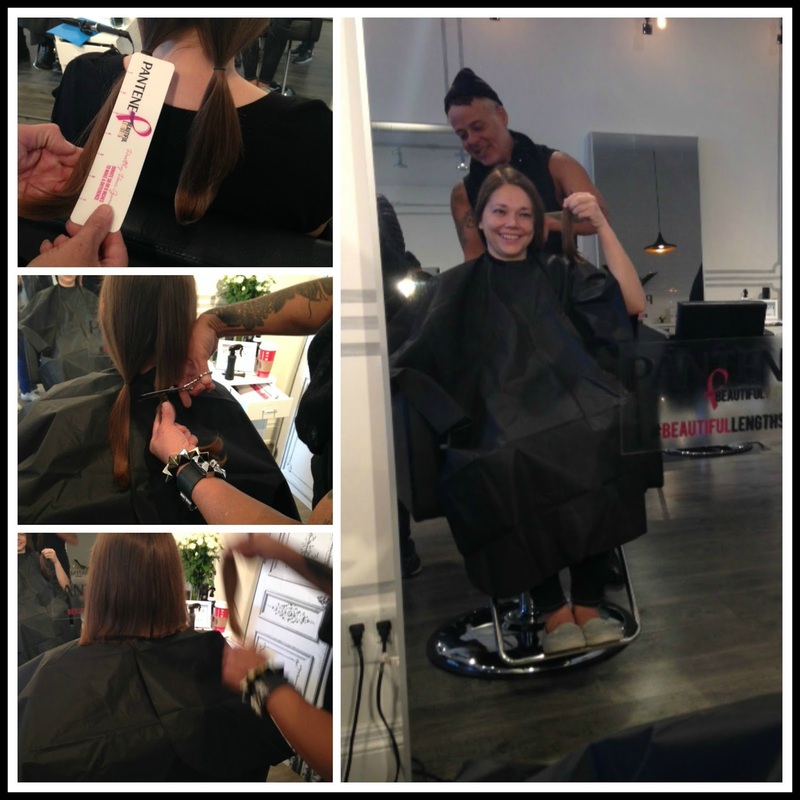 New this year is the 8 inches or $8 challenge, allowing folks to contribute even if their hair isn't suitable to donate (the program can't accept chemically treated hair or hair that is more than 5 per cent grey). You can donate online here. "Wig recipients are truly grateful," Deirdre told me. 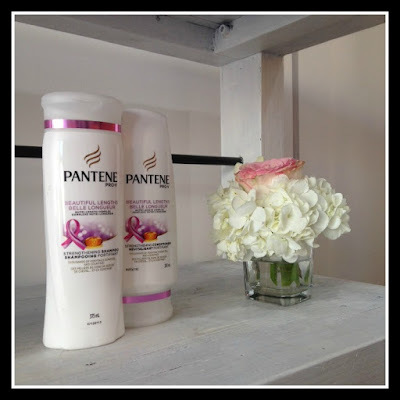 "The Canadian Cancer Society is wildly grateful to Pantene for running the program - they make a phenomenal contribution to the lives of these women." An average wig can cost $1,200 to $9,000. Each real hair wig requires 8-15 ponytails in order to create different lengths and looks. The ultimate goal is for each woman to find a wig that suits her style and usual appearance so she looks and feels as normal as she can. Sunnybrook in Toronto has a wig room right in the hospital to assist patients, while women living near Peterborough can visit the Community Office to look at and try on wigs. Staff are on hand to assist with the process and also support women on an emotional level. If you, or someone you know, is fighting cancer and you would like assistance, you can call the Canadian Cancer Society's toll-free 24 hour line at 1-888-939-3333 or visit Cancer.ca. There have been over 800,000 ponytails donated to the Pantene Beautiful Lengths campaign in North America thus far. Most of us know someone who has fought cancer - if you don't have 8 inches of hair to donate, please consider donating 8 dollars (or more! ).